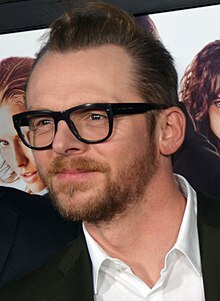 سایمون پق (اینگیلیسجه: Simon Pegg) بریتانیالی فیلمین سناریو یازاری, کومدین, فیلم یاپیمجی‌سی و اوْیونچو. ۱۴ فئوریه ۱۹۷۰ ‏ ایلینده دۆنیایا گؤز آچیب. 1995–گۆنوموز ایللر آراسیندا سینما ساحه‌سینده چالیشیب. 1999 Tube Tales Clerk Segment: "Steal Away"
2007 Grindhouse Cannibal Segment: "Don't"
1997 I'm Alan Partridge Steve Bennett Episode: "Watership Alan"
2000 Randall & Hopkirk Justin Pope Episode: "Paranoia"
2001 Brass Eye Gerard Chote Episode: "Paedophilia Special"
Dr. Terrible's House of Horrible Angus Episode: "Curse of the Blood of the Lizard of Doom"
2002 Look Around You Sleeping Queen's Guard Episode: "Maths"
Linda Green Jay Episode: "Dark Side of the Moon"
2004 Black Books Evan Episode: "Manny Come Home"
2005 Look Around You Handsome Man Episode: "Health"
Doctor Who The Editor Episode: "The Long Game"
↑ Voice of Reepicheep Recast Once Again as Simon Pegg. ↑ The Official Website of Simon Pegg. Peggster.net (25 November 2010). یوْخلانیلیب3 January 2011. ↑ We Know Where You Live. BBC Comedy. آرشیولنیب اصلی نۆسخه‌دن on 16 December 2004. یوْخلانیلیب18 June 2007. ↑ Simon Pegg Joins Amazon's 'The Boys'; Makes Surprise On-Stage Appearance – New York Comic Con (October 5, 2018). یوْخلانیلیبOctober 5, 2018. اینگیلیسجه ویکی‌پدیاسی‌نین ایشلدنلری طرفیندن یارانمیش«Simon Pegg»، مقاله‌سیندن گؤتورولوبدور. ( ۲۲ ژانویه ۲۰۱۸ تاریخینده یوْخلانیلیبدیر). قارداش پروژه‌لرده سایمون پق گؤره داها آرتیق بیلگی‌لر تاپابیلرسینیز. بۇ صفحه‌‌ سوْن دفعه ‏۱۳ مارس ۲۰۱۹، ‏۱۲:۳۶ تاریخینده دَییشدیریلمیشدیر.